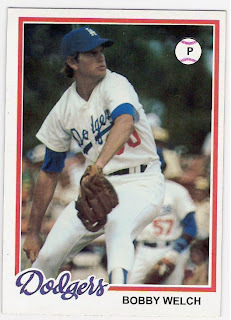 here is one of my favorite cards that should have been in my 1978 topps burger king dodger/update set project. 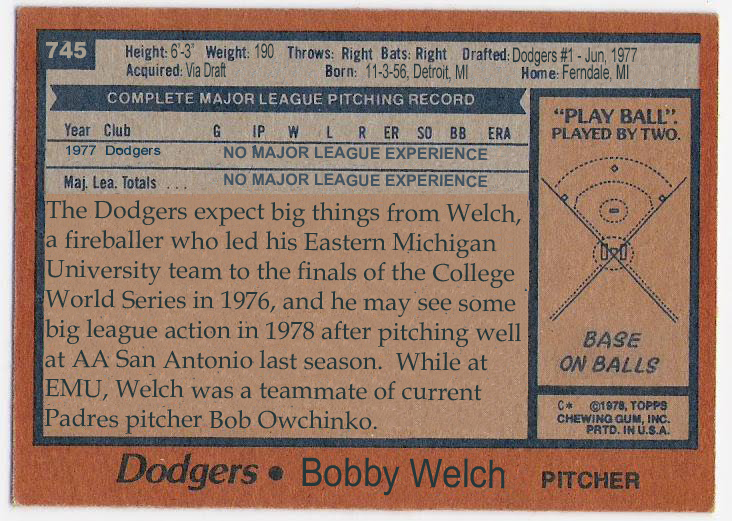 that's right - it's the bobby welch 1978 topps burger king dodger/update card that should have been. welch was the dodgers' first round pick in the 1977 draft, and he debuted about a year later in june of 1978. in his first game, he pitched two scoreless innings in a loss to the astros. 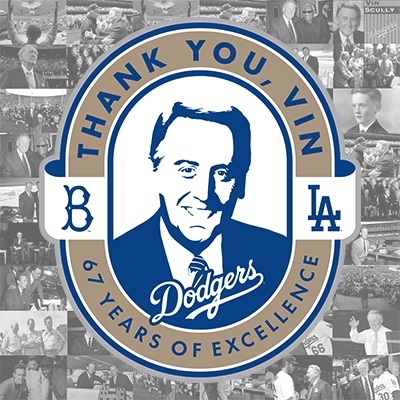 it should be noted that welch struck out the first batter he faced - mike fischlin. the next day, welch relieved again and earned his first big league win. in his next appearance, he earned his first save and then made his first career start in his 4th appearance and got his second win. so, in his first 5 appearances in the big leagues, welch was 2-0 with 2 saves and 13 strikeouts in 12.1 innings. 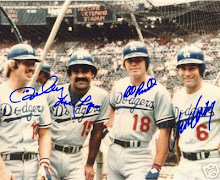 of course, the highlight of welch's 1978 season came in game 2 of the world series when he relieved terry forster with two on, one out, and the dodgers clinging to a one run lead in the 9th inning. welch got thurman munson to fly out, and then earned the save by striking out mr. october in one of the most nerve wracking at bats i have ever seen. 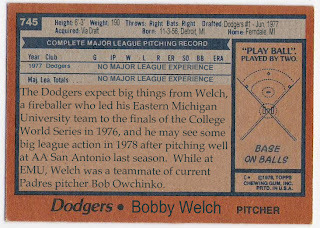 so, here's to you bobby welch and your 1978 topps burger king dodger/update card that should have been! is this too bold of a prediction? 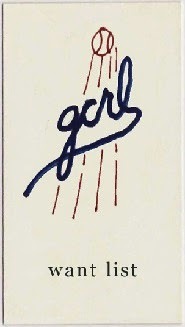 why is this card awesome? son of fletch - as far as you know.